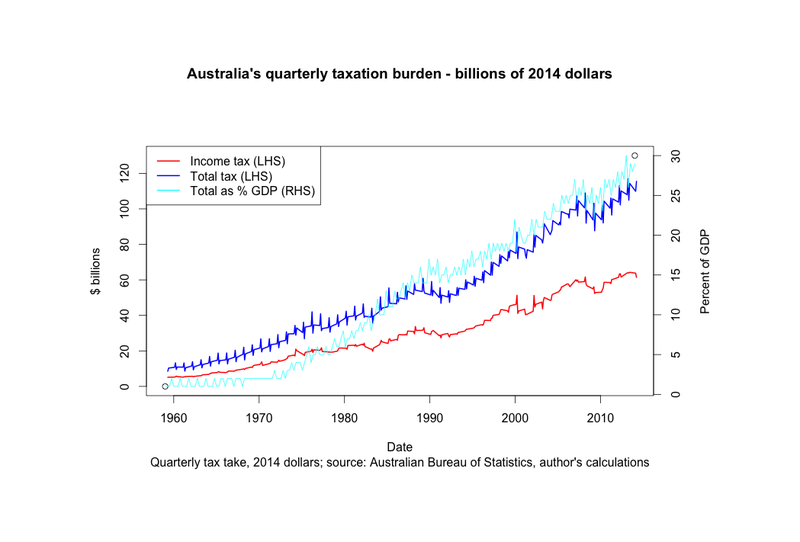 The tax burden in Australia has been on the rise for decades. In particular, the total tax take, expressed as a percentage of GDP, has accelerated from the early 1970s. The chart below has all dollars expressed in the equivalent 2014 values. The total tax burden has risen from around $10bn per quarter in 1960 to $27bn per quarter in mid 2014. Of this, income taxes have been rising, but not at the same rate as total taxes. The total tax burden as a percentage of GDP has risen over this period from 1% to 30%. This trend is unsustainable. No economy can survive an ever increasing tax burden. Some other countries have already passed a tipping point. Australian political leaders need to take note.